"Transforming the shabby into the chic!" 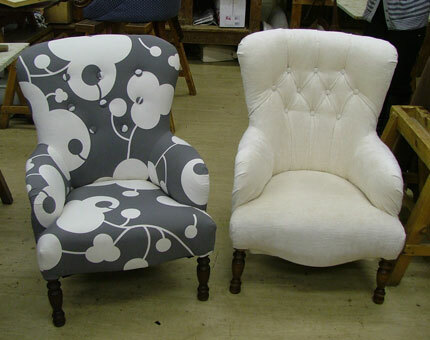 This picture is interesting because it shows how two identical chairs can be re-upholstered in different ways to give two very different looks. I recovered the chair on the right with deep buttoning to give it a very traditional look, whereas a fellow student recovered the chair on the left in a very contemporary fabric with floating buttons. The end result demonstrates how a period style chair can either be brought up to date or sympathetically restored to it's former self. I offer everything from simple re-covering in a new top fabric to a complete re-upholstering service which includes replacing webbing, springs and stuffing if necessary. I use traditional methods of upholstery to re-upholster anything from antiques and vintage furniture to reproductions and more contemporary pieces. I am happy to re-upholster anything from footstools, ottomans and headboards, to dining chairs, occasional chairs and armchairs. I offer free quotations and a free measuring up service. Click here to go to the website gallery, where you can view examples of the re-upholstery work that I have completed. Perhaps browsing through the before and after pictures will give you inspiration for your own pieces.